Lively and quite fruity on the nose with cherries, dark berries, cooked apples, pears and oranges. Then notes of crisp barley arrive, nicely mixed with roasted bread and a touch of black pepper in the back. Pleasantly intense. Quite strong on the palate. Fruity and sweet at first with cherries, oranges, pears and apples. Then an intensive warmth emerges with oak, pepper and delicate cinnamon spice. Creamy almost oily with barley sugar, hazelnuts, milk chocolate and a whiff of smoke towards the finish. The finish is long, warm, creamy and slightly bitter-sweet with Seville oranges, subtle toffee, nutmeg and a touch of oak on the tail. The intensive fruitiness on the nose is a bit tamed when adding water. The delicate sweetness, however, remains while subtle floral notes (heather, hay) and oak arrive. Still strong on the palate but lively. Sweet with barley sugar and fruity. Slightly bitter and dry towards the finish with prickling oak, pepper and nutmeg. The finish remains long, warm and fruity with oranges. Becomes drier on the tail with oak, tobacco leaves and a hint of heather. An old school whisky from the seventies, surprisingly fruity for its age. 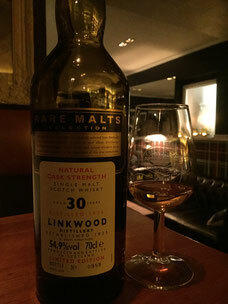 It has enough power with its almost 55% abv, whereby the sweetness and fruity notes are very well balanced by the warming spices of the oak casks. Even livelier with water, although dry woody notes significantly come to the fore. A complex and delicate whisky.